The Texas Christian Horned Frogs continue to roll along under head coach Gary Patterson as they’ve won at least 11 games in three of the last four years. The Horned Frogs went 11-3 last season, but they were only left to ponder as to what could have been as two of those losses were against the Oklahoma Sooners who won the Big 12 Conference. But as Patterson continues to recruit solidly within the talent rich State of Texas along with his coaching ability, 2018 could see TCU in position to win their first outright Big 12 Title in school history. After seeing the field sparingly as a freshman in 2017, quarterback Shawn Robinson will get his opportunity to be the guy this year in Fort Worth. Robinson is another in the line of mobile that Patterson uses in his system, and now it is time to see if he’ll be ready to handle the pressure of being a full-time starter. Junior running back Darius Anderson averaged 6 yards per carry and his and elusiveness with be vital if the Horned Frogs are going to win the Big 12. Texas Christian’s offensive line does not feature any seniors, and it will be interesting to see how that plays out as the season progresses. Last year the Horned Frogs had the top defense in the Big 12, while they were 19th in the nation overall. Chad Glasgow in entering his fourth year as TCU’s defensive coordinator and he has unit that is quick enough as well as being athletic enough in order to contend with the fast paced offenses in the conference. One player to keep an eye on will be senior defensive end Ben Banogu. Banogu was second on the team in sacks in 2017 with 8.5, and he has the makings of being the Big 12 Conference’s Defensive Player of the Year. After falling just short of winning the Big 12 last year, TCU will find themselves in contention once more with some very important games on the docket. On September 15, the Horned Frogs with the Ohio State Buckeyes of the Big Ten Conference in an affair that will go a long way in shaping the College Football Playoff picture. And when Big 12 Conference play begins, Texas Christian will have to travel to face the Texas Longhorns and West Virginia Mountaineers, while their October 20th home meeting with the Oklahoma Sooners could be a preview of the conference championship game. 2017 marked the first time since 1998 that the Oklahoma Sooners took the field without Bob Stoops as their head football coach. And the first year of the post-Stoops era was successful for the Sooners as they were able to claim their 11th Big 12 Conference Title. Oklahoma put together another stellar campaign in 2017 largely in part to the contributions to quarterback Baker Mayfield. However with the graduation of Mayfield, what will head football coach Lincoln Riley be able to accomplish in his second year at Oklahoma? Junior quarterback Kyler Murray will now be responsible to keep Oklahoma’s uptempo offense going. Murray began his collegiate career with the Texas A&M Aggies before transferring to Oklahoma. In limited action for both A&M and Oklahoma, Murray has thrown 8 touchdowns to 7 interceptions. At 5’10”, 192 lbs., Murray is slight in stature, but he has extremely elusive as a runner which is something that Riley will use to help the Oklahoma offense. Last year the Sooners were 27th in the nation in rushing offense, and with Murray leading the way, you can expect more of the same. Running backs Rodney Anderson and Trey Sermon were a tough combination to deal with last season coming out of Oklahoma’s backfield. Anderson averaged 5.9 yards per carry, while Sermon tallied 6.0, and I expect the Sooners to lean on opponents in the Big 12 with their rushing attack. With Oklahoma’s running game leading the way, I expect the aerial attack to benefit from play-action passing with junior wide receiver Marquise Brown being a big-time target. And led by senior left tackle Quinn Mittermeier, Oklahoma will have an experienced offensive line with three upperclassmen as starters as this offense will once again be a force to be reckoned with. Last season the Sooners had the fourth best defense in the Big 12, and under the guidance of longtime defensive coordinator Mike Stoops, they’ll once again have what it takes to contain the high powered offenses in the conference. Two players to keep an eye on will be sophomore middle linebacker Kenneth Murray and junior cornerback Parnell Motley. Both Murray and Motley have what it takes to be all-conference performers as they pace this defense to set up the team’s explosive offense. Oklahoma will once again be the team to beat in the Big 12, but the road to the conference title won’t be easy as they’ll have road meetings with the TCU Horned Frogs and West Virginia Mountaineers, as well as their annual showdown with the Texas Longhorns at the Cotton Bowl. Oklahoma will also host the UCLA Bruins of the Pac-12 Conference on September 8 as this meeting could potentially improve their chances of once again making the College Football Playoff. Under head football coach Bill Snyder, the Kansas State Wildcats continue to fly under the radar, but at season’s end they generally find themselves as one of the top teams in the Big 12 Conference. The Wildcats fought, scrapped, and clawed their way to an 8-5 mark in 2017, and once again they will be a squad that should not be overlooked in the Big 12. It’s all about the dual-threat quarterback in Snyder’s offensive system, and sophomore Skylar Thompson will be the next one to have his crack at it. Thompson saw limited time last season behind quarterback Jesse Ertz. But with Ertz having graduated, Thompson will get to show what he can do. At 6’2″, 209 lbs., Thompson brings the speed element to the table. And after the Wildcats were 32nd in the nation in rushing last season, you can expect more of the same in the Little Apple with Thompson leading the way. Along with the running ability of Thompson, you can expect junior running back Alex Barnes to get a heavy dose of the carries as he’ll be running behind one of the most experienced offensive lines in the Big 12. Led by senior guard Abdul Beecham, K-State will have a pair of seniors, and three juniors on their starting offensive line as that experience will go a long way in Snyder’s ball control offensive system. Defensively the Wildcats will be a work in progress as the season goes along. But with three seniors and six juniors in Kansas State’s starting lineup, defensive coordinator Tom Hayes will do his best to find a way for his unit to contend with the high-powered offenses of the Big 12. The Big 12 is never an easy conference to navigate and for K-State they will have their hands fulls with road meetings with the West Virginia Mountaineers, Oklahoma Sooners, and TCU Horned Frogs. The Oklahoma State Cowboys are in the midst of their best run in school history as they’ve gone 10-3 in four of the last five years. However the Cowboys continuously come up short versus the Oklahoma Sooners in the Bedlam Game which has prevented them from winning the Big 12 Conference since 2011. Oklahoma State head football coach Mike Gundy continues to put one of the most exciting teams in college football on the field due to the offense’s ability to light up the scoreboard. And although that the Cowboys will have some new faces on offense in 2018, will it be enough for them to win the Big 12? After spending the last three years as the understudy to quarterback Mason Rudolph, Taylor Cornelius will now have his chance to run Gundy’s offense. At 6’6″, 225 lbs., Cornelius is a big quarterback that can stand it the pocket, and more importantly, he can sling the football all over the field. At 5’10”, 185 lbs., junior running back Justice Hill is a speed demon who’ll keep defenses in the Big 12 on their toes. Last season Hill rushed for 1,347 yards and it would not surprise me to see him reach the 1,500 mark in the category this year. Hill is also a reliable and durable running back for Gundy as he should flirt with getting 275 carries in 2018. Oklahoma State may have lost wide receivers Marcell Ateman and James Washington to the National Football League, but there is never a shortage of quality pass catchers in Stillwater. Senior wide receiver Jalen McCleskey will be Cornelius’ go-to-guy in the passing game this season as his speed will be an asset; especially on third down when it is time to move the chains. Under Gundy, defensive football has never been a hallmark for Oklahoma State which will once again be the case in 2018. However one player to keep an eye on will be junior cornerback A.J. Green. Last season Green led the Cowboys in interceptions with 4, and his ball hawking skills will keep him in the conversation of being an All-Big 12 performer. Oklahoma State isn’t known to play a tough non-conference schedule, but they will host the Boise State Broncos from the Mountain West Conference on September 15. However Oklahoma State’s season will be defined by what they do in November as road meetings with the Oklahoma Sooners and TCU Horned Frogs will determine if they’ll be able to make the Big 12 Title Game in Arlington. For the first time since 1989, the Texas Longhorns have put together five consecutive seasons in which they’ve been unable to finish in the Associated Press’ Top 25 poll; however there finally appears to be some light at the end of the tunnel in Austin. The Longhorns are coming off of their first winning season since 2013 as head football coach Tom Herman is building a strong foundation for his program. Now it’s just a matter of whether or not that 2018 will be the year where Texas is ready to re-emerge as being one of the top teams in the Big 12 Conference. The biggest question for the Longhorns heading into a new campaign is who is going to be the team’s starting quarterback. Last year saw Herman use both Sam Ehlinger and Shane Buechele at starting quarterback for Texas. The junior Buechele and the sophomore Ehlinger each possess strong arms, along with pocket awareness. This will be a fierce battle for playing time, but in the best interest of the team, Herman needs to determine a clear-cut starter, and more importantly, stick with him. But whomever the Longhorns starting quarterback will be, he will need to benefit of having an improved running game. Last year Texas was 96th in the nation in rushing as Ehlinger led the team in rushing with just 368 yards. And this was a huge fall for a Texas program which has produced storied runners such as Earl Campbell and Ricky Williams. But as a whole the Texas offense must improve as they were 65th in the nation in total offense last season as Herman is hard at work to remedy this, which means getting the top high school talent in the Lone Star State to play for him. Todd Orlando is entering his second year as Texas’ defensive coordinator. Last year Orlando was able to lean on linebacker Malik Jefferson and safety DeShon Elliot for on-field leadership. But with Jefferson and Elliot each now pursuing careers in the National Football League, who will step and be that leader for Texas? One player to keep an eye on will be senior outside linebacker Gary Johnson. The Horns need an emotional leader on defense who can also make impact plays, and if Johnson can be that guy, it will go a long way. Overall the Longhorns will have seven seniors and three juniors as starters on defense. And hopefully that experience, along with Orlando’s blitz happy system will lead to a stingy Texas defense in 2018. Texas cannot be accused of playing a cupcake non-conference schedule as they’ll travel to face the Maryland Terrapins of the Big Ten Conference to kick off their season, while they will host the USC Trojans of the Pac-12 Conference on September 15. And when Big 12 play begins, the Horns will open up at home versus the TCU Horned Frogs, while you can never overlook their annual showdown in Dallas against the Oklahoma Sooners as well as road affairs with the Kansas State Wildcats and Oklahoma State Cowboys. It is not that often where the Iowa State Cyclones have something positive to build off of coming into a new college football season, but that is the scenario for them this time around. The Cyclones shocked many experts who pegged them to have another losing campaign in 2017 as they went 8-5 with a 5-4 record in the Big 12 Conference. And included in Iowa State’s rise to respectability were upset victories over the Oklahoma Sooners and TCU Horned Frogs who were the two teams that played in the Big 12 Championship Game. But as the Cyclones crept up on opponents in 2017 to secure their first winning season since 2012, will they find a way to secure consecutive winning campaigns for the first time since 2005? Defense was the name of the game for the Cyclones in 2017 as they were third in the Big 12 in total defense. Iowa State will miss the contributions of linebacker Joel Lanning who led the team in tackles last season with 114. But for Iowa State head football coach Matt Campbell, he still has a solid defense. Junior linebacker Marcel Spears Jr. was second on the Cyclones last season in tackles with 107 and he’ll be in the running to be one of the top defenders in the Big 12. Another player to keep an eye one will be junior outside linebacker Willie Harvey. Harvey amassed 76 tackles last season, and his ability as a weak side defender will be important for Iowa State as they look to remain relevant in the Big 12. But it’s just not about Iowa State’s linebackers as junior defensive end JaQuan Bailey will be one of the best pass rushers in the Big 12 as he knows how to use leverage in order to fight off offensive linemen and get to the quarterback. However as good as things can be for Iowa State on defense, their struggles on offense are very recognizable. Last year the Cyclones were 86th in the nation in total offense as they were limited to 20 points or less in four games. But if the legs of junior running back David Montgomery are able churn enough in order to sustain the Iowa State offense, it could give this team enough balance to offset their defense as they look to continue being a tough out in the Big 12. The Cyclones have a chance to once again shock the college football world when they begin their Big 12 campaign at home versus the Sooners. Last year Iowa State went on the road and upset Oklahoma, and now they will look to defeat the Sooners in consecutive seasons for the first time since 1961. But the road in Big 12 is always tough to navigate for any team, and for Iowa State they’ll have to travel to face the TCU Horned Frogs, Oklahoma State Cowboys, and Texas Longhorns which in itself is no easy task. The 2017 college football season began on a very positive note for the West Virginia Mountaineers, but it didn’t end in that manner. The Mountaineers lost their final three games of the season which all came by 14 points or more as instead of winning 10 games for the second consecutive season and possibly winning the Big 12 Title for the first time in school history, they had to settle for a mediocre 7-6 campaign. But as the Mountaineers have only won 10 games in a season twice under head football coach Dana Holgorsen during his seven-year tenure in Morgantown, can we expect West Virginia to take the next step in 2018? After transferring from the University of Florida, and serving a one-year suspension after testing positive for a banned substance, quarterback Will Grier made a name for himself in 2017 with West Virginia. Grier lit it up in Holgorsen’s spread offense as he completed 64.4% of his passes, while throwing 34 touchdowns. 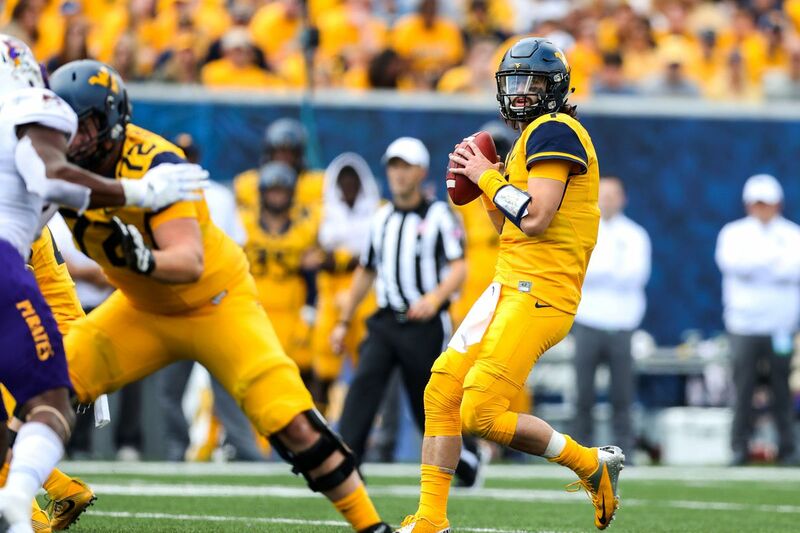 Now Grier has a full season under his belt with the Mountaineers, and heading into his senior campaign, he has everything in his arsenal to be the best quarterback in the Big 12. Grier has a duo of talented senior wide receivers to throw the football to in David Sills V and Gary Jennings. Both Sills and Jennings have big play ability, and Grier is never afraid to throw the football their way. Overall West Virginia was 13th in the nation last year in passing offense, and as the football will be flying around Morgantown once again, it’ll be up to the offensive line and senior left tackle Yodny Cajuste to protect Grier in order for him to get the football down the field. Defensively the Mountaineers were several steps behind their offense as they were 109th in the nation last season in total defense. Defensive coordinator Tony Gibson is in his fifth year at West Virginia and he needs to find a way to get more out of his unit. Two players to keep an eye on defense for West Virginia will be junior outside linebacker David Long and sophomore free safety Kenny Robinson. Last year as a true freshman, Robinson tied for the team lead in interceptions with 3, while Long is West Virginia’s leading returning tackler. And if Robinson as well as Long are able to build off of their success from 2017, it could be enough to allow the Mountaineers defense to slow down the high-powered offenses in the Big 12. The Mountaineers will get things going on September 1 when they take on the Tennessee Volunteers of the Southeastern Conference in Charlotte, while they’ll travel to face the North Carolina Wolfpack of the Atlantic Coast Conference on September 15. But when the Big 12 season rolls around, the Mountaineers will need to load up on wins early as their final four conference games will see them face the Texas Longhorns, TCU Horned Frogs, Oklahoma State Cowboys, and Oklahoma Sooners. If ever there was a team who embodied “The Mendoza Line” in college football, it would be the Texas Tech Red Raiders. In the last nine years the Red Raiders have won between four to eight games per season as they’ve never been able to get over the hump in the Big 12 Conference. Kliff Kingsbury has been Texas Tech’s head football coach for the past five years and his “Air Raid” offense can light up the sky in Lubbock, but his defense is nothing to write home about. Texas Tech was ninth in the nation in passing offense last season, but they were 105th in total defense. And if Tech is unable to find more balance on both sides of the football, they will endure another up and down season. 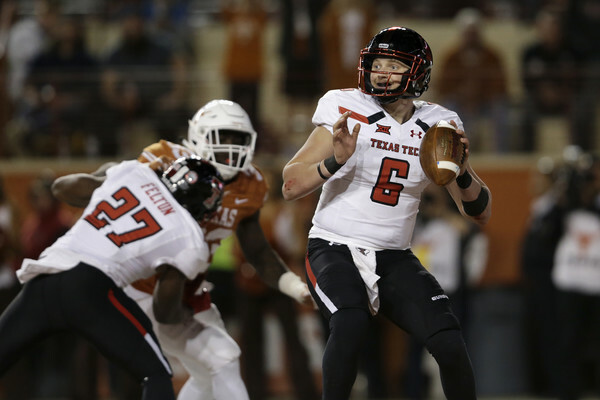 With the graduation of quarterback Nic Shimonek, junior McLane Carter is in line to be Texas Tech’s third different starting quarterback in the last three years. Carter saw limited action behind Shimonek last year, but he has had several years to familiarize himself with Kingsbury’s system which should pay off. As previously mentioned, the Red Raiders struggled on defense last season and it’ll once again be an issue for them. Senior outside linebacker Dakota Allen led the Red Raiders in tackles last season with 102, while junior middle linebacker Jordyn Brooks was third with 89. Allen and Brooks will once again be two of the better tacklers in the Big 12, but they’ll need to find a way to help Tech get off of the field on third down as they were 92nd in the nation last season in third down conversions allowed. The Red Raiders must also find a way to get more pressure from their defensive line as Texas Tech only recorded 18 sacks last season. Texas Tech must also improve on third down as opponents were able to convert more than 42% last season in this critical category. The Red Raiders will open their season on September 1 in Houston when they face the Mississippi Rebels of the Southeastern Conference, while they’ll host the Houston Cougars of the American Athletic Conference on September 15. The Red Raiders will have their hands full in Big 12 play as their schedule includes road games versus the Oklahoma State Cowboys and TCU Horned Frogs, while they’ll host the Oklahoma Sooners and Texas Longhorns on consecutive Saturdays to begin the month of November. For Texas Tech and Kingsbury, they will have their work cut out for them as they look to be bowl eligible for the third time in the last four years. As quickly as the Baylor Bears became a national power in college football, they have declined as rapidly. Looming NCAA sanctions are hovering over Baylor and their 1-11 campaign in 2017 is a shining example of that. When Matt Rhule became Baylor’s head football coach last year, he knew what he was getting into as his team took its lumps. But as Rhule is attempting to establish himself on the recruiting trail in the talent rich State of Texas, will 2018 mark the beginning of the turnaround in Waco for Baylor? Last year saw sophomore Charlie Brewer and junior Zach Smith split time at quarterback for Baylor. And since neither man has been able to distance himself from the other, you can expect an open competition once again heading into the new season. But whomever will be the starting quarterback for the Baylor in 2018, he has a play making wide receiver to get the football to in junior Denzel Mims. Mims was the lone bright spot for Baylor’s offense last season as he averaged 17.8 yards per catch, while he also had four games in which he gained more than 100 yards. At 6’3″, Mims is a big receiver and his frame allows him to shield off most defensive backs which is a huge advantage for the Bears offense. Defensively the only way for Baylor to go is up after they were 112th in the nation last year in total defense which included surrendering 40 points or more in a game four times. Phil Snow is set to begin his second year as Baylor’s defensive coordinator and his unit must find a way to improve in all facets of the game if they are going to keep up with the explosive offenses in the Big 12. Once again Baylor will be fighting an uphill battle in the Big 12, but Rhule must continue building and reshaping this program, and most importantly become more competitive. It’s safe to say that the Kansas Jayhawks have been struggling on the gridiron. The Jayhawks last winning season came in 2008, while they have not won more than three games in a season since 2009. David Beaty has been the head football coach at Kansas for the last three years and in that time the Jayhawks have only been able to win one conference game in the Big 12. Kansas has become the whipping boys of the Big 12 as last year saw nine of their opponents score at least 40 points, while their average margin in the loss column was 25 points. And as a new season is upon us in college football, things don’t appear to be getting any better in Lawrence. When you go 1-11 like Kansas did last year, there are not too many positives to build off of; however two players to keep an eye on will be junior running back Khalil Herbert, and senior linebacker Joe Dineen Jr. Herbert averaged 5.5 yards per carry last season, and what Kansas will need to do this is to establish their running game early and often in games in order to give themselves a puncher’s chance in games. Last season Dineen was one of the top tacklers in the Big 12 as his 137 tackles were tops on the team. But if Kansas is unable to score points as they were 118th in total offense last season, it won’t help a defense that was 118th in the nation get off of the field. There won’t be any miracles on the gridiron this fall for Kansas which means that you can expect another long campaign for the Jayhawks.